I would like to thank you for briliant dog. Kilimandzaras is hunting ducks perfectly (even now when he is still so young)! Also he is following blood and finding dead animals. I am very pleased to have him. Hipnoza is excellent in work. She searches the area well, wants to find game, carries her head high and well and she has quite a lot of stamina in searching. Her retrieving skill is great, she points well. She is very good at fresh bloodtracking and chase also. I asked my husband every day if I could have another dog until someday I heard that he goes along with it! Erin was supposed to be a normal dog to love, but I got a special female which we raise the world with! I wish everyone great joy, success and a lot of moments with our quadruped friends when the dreams come true! Thank you for giving me the opportunity to have a dog from your kennel! 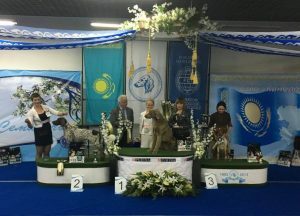 Sharon already participated in 4 dog shows in Italy in puppy class and every time she got „very promising“. My next goal is to obtain with her Italian Champion of Beauty title in the future! Dear Wojtek, I am writing these few words to say how happy and lucky I feel that you came into my life some good 12 years ago. I own you almost everything I know about Kurzhaars and their breeding as you are always willing to share your knowledge and lifetime experiences about this lovely breed. I consider you to be one of the best breeders in the world. 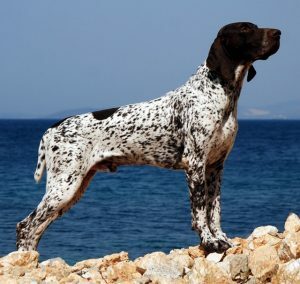 Very professional, with high standards and this can be clearly seen in the results of your breeding. I will forever be grateful to you for my Don z Czarnego Dworu. A dream dog both in confirmation and hunting qualities. Thank you my friend ! I want to say a huge thank you for letting me have my Sieger z Czarnego Dworu. My boy is already 18 months old and I couldn’t be happier with him. 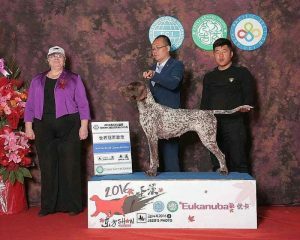 He is a great character, very typical of his breed with massive passion for hunting. Also fast learning, beautiful in confirmation and a lovable member of our family. 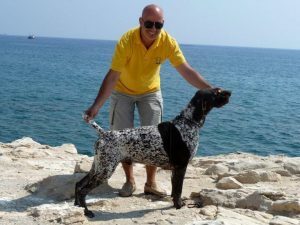 At the age of only 12 months old he was awarded with CAC - JBOB and BOS at the 2016 Cyprus Kurzhaar Club show. 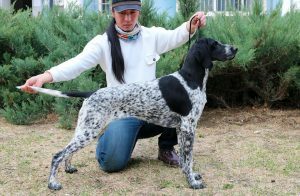 He also passed the breeding test with excellent at the age of 14 months old. I thought that after so many years of dealing with Kurzhaars I had seen it all but Sieger keeps surprising me every day! Wermut is a happy and nice dog with lot of energy. Everyone thinks he is a beautiful dog, when we walk in the city people stop us and tell us that he is beautiful. We are very happy for him! Thanks! On January 14, 2004 we received your dog registered as "Alan", by us called "Brutus". I write these few words to thank you once again for the great dog, who has been with us since the date and will soon be 14 years old. Despite this age is still well. He never showed aggression or too much irratibility, he liked to play. 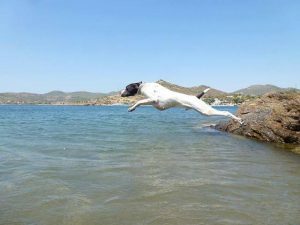 He quickly learned and understood what is required from him, he perfectly retrieved from the lakes and from the water, loves to swim. He gives us a lot of pleasant experiences.